In my early twenties, my parents made the impulsive decision to purchase a house in Eagles Mere. Suddenly we moved up a notch in the world–we were no longer renters, we were owners. Now we were a few steps higher in the local pecking order. Ever since they bought the house, we have had the opportunity to experience Eagles Mere throughout the year rather than solely the first two weeks of August. We have been there for snow storms and beautiful autumn breezes and have enjoyed many games of Scrabble before the heat of the wood stove. In June 2009, my husband and I celebrated our love for one another and for this special place as we had a memorable wedding weekend in Eagles Mere. Planning a wedding in Eagles Mere could only be described as a unique experience. While I live in Philadelphia, a metropolitan city in which I need not look far for anything I need, all of our wedding vendors were located in the nearest “big town,” which was 45 minutes away. Williamsport is known for the Little League World Series, which, coincidentally, culminated this weekend. Congratulations, Japan. On the way to Williamsport is the small, blue-collar town of Hughesville, Pennsylvania. About two years ago, my parents mentioned that they had heard about a little cafe in Hughesville that served up unique, organic fare. They checked it out and we were intrigued yet skeptical when they mentioned that my dad had enjoyed a shot of wheatgrass. Folks don’t eat or drink wheatgrass in Northeast, PA, home of “Welcome Bowhunters” signs and hunters’ breakfast specials. However, my parents enjoyed it and we decided to check it out. Well, I don’t really remember our first meal there, but I will say that we now try to visit Kathy’s Cafe each time we’re in Eagles Mere. I have an admission to make. I’m a mixer. I love eating a number of food items mixed together into an unidentifiable and toothsome glob. One of my favorite things about Thanksgiving leftovers is taking a little mashed potatoes, coleslaw, gravy, corn and a splash of cranberry sauce and mixing it all up for breakfast the next morning (or maybe a little late night snack.) Kathy’s has embodied this secret love of mine in breakfast form and it’s called the Scromlet. The etymology of “scromlet” is pretty decipherable. It’s a mix between a scramble and an omelette. ARE YOU KIDDING ME??? 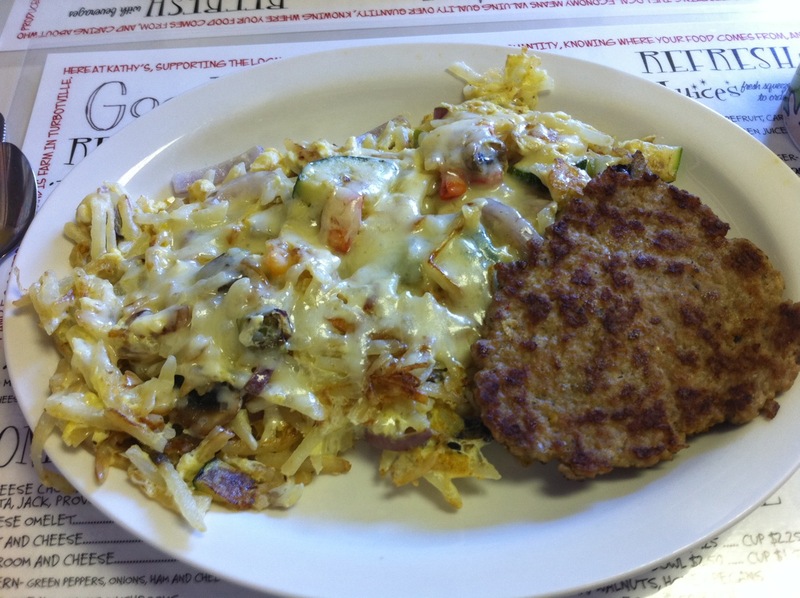 The scromlet is comprised of two eggs scrambled with hashbrowns and veggies and topped with cheddar cheese. I should clarify that I am referring to the “Sarah Scromlet,” which I order every single time I visit Kathy’s–including twice this weekend. Kathy’s is fashioned to look (and sound) like a 1950s soda fountain. 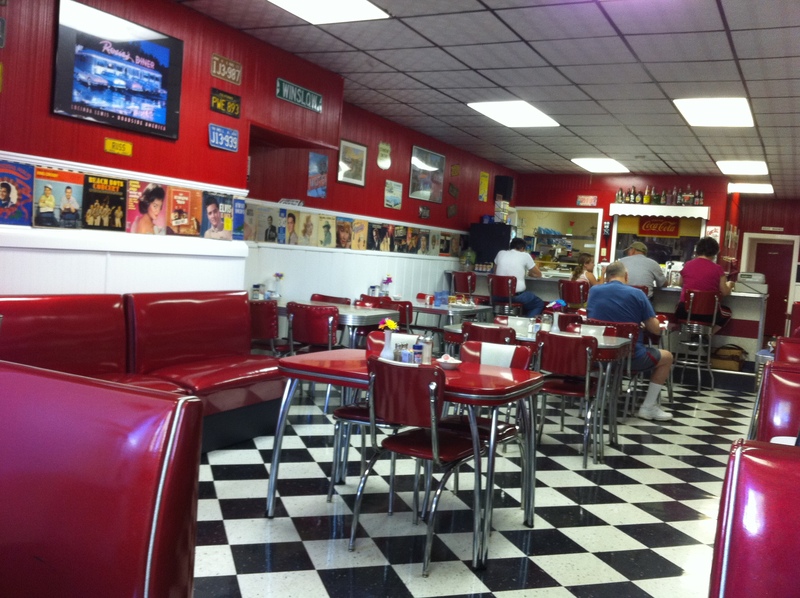 The booths and chairs and red vinyl and the walls are decorated with posters and albums from the era including Elvis, The Beach Boys, Marilyn Monroe, The Platters and Sam Cooke. They also have a number of license plates from various states that, coincidentally, all have our wedding date on them. I was in the mood for poached eggs on Friday but chose to abstain because my parents would be coming into town and I knew I could talk my dad into making his famous poached eggs for breakfast Saturday morning (I ended up going to Kathy’s again, but that’s another story.) 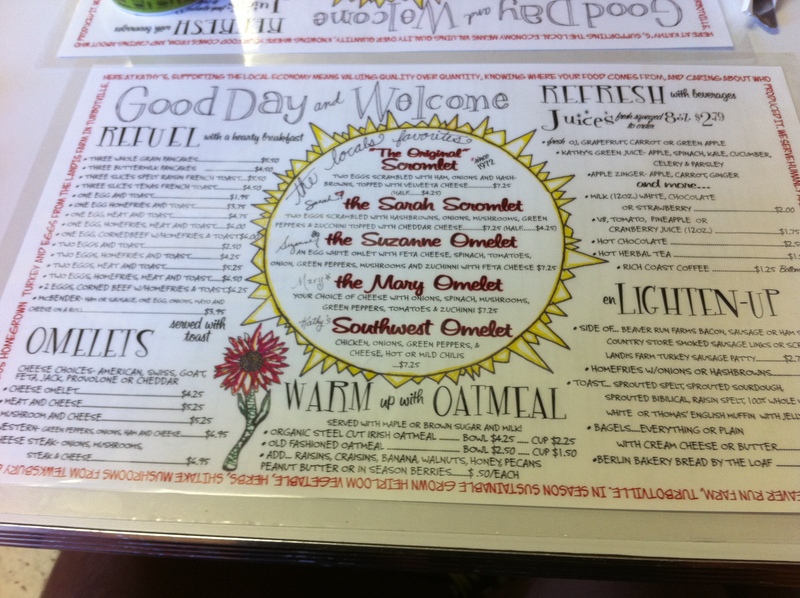 I ended up ordering the Sarah Scromlet and wondering why I even bother looking at the menu. Kathy’s is a bit of a dichotomy (or tri/quadotomy) While it presents itself as a 1950s cafe, the the menu is full of fresh and local ingredients. The waitresses are old and slow, yet extremely friendly, although I’ve heard a mispronunciation of the word “heirloom” more than once. Kathy’s also lists the source of many of their ingredients without looking pretentious as many restaurants tend to do. I ordered the Landis farm turkey sausage (okay, I order that every time too.) My husband ordered a glass of the fresh squeezed grapefruit juice because they were out of apples. The only problem that arises in ordering these fresh squeezed juices is the fact that they actually are fresh sqeezed. If there’s only one waitress on duty and the table in front of you orders a juice–worse yet, FOUR juices–don’t expect coffee any time soon. Luckily, we were the only ones ordering juice and our drinks and food came quickly. The Sarah Scromlet was as good looking (and tasting) as ever. I’m a really nice mom because I always take home a hunk of sausage to my dog, Jewels, even though I could demolish the entire patty myself. 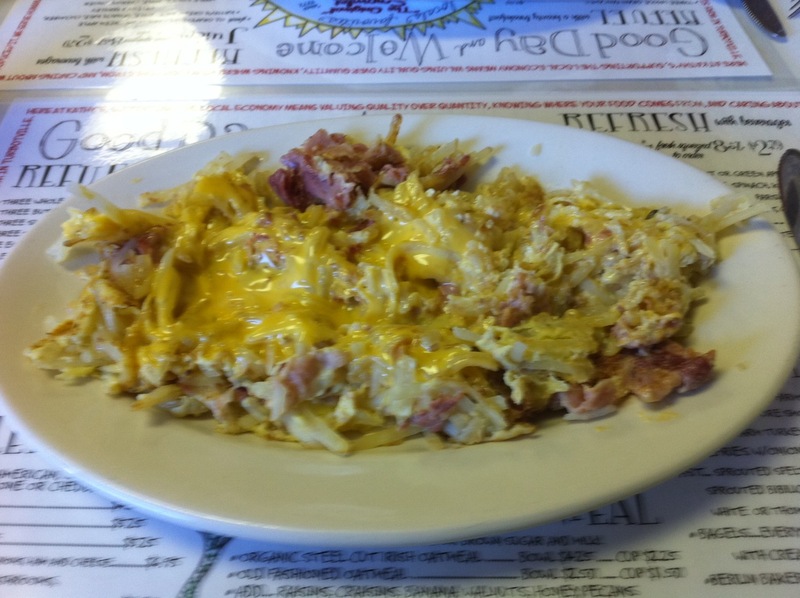 My husband had the original scromlet with eggs, hashbrowns, ham and velveeta cheese. This is the truth. I cannot even begin to describe the pleasure of biting into a scromlet. Imagine all the best things about breakfast. Now imagine them together. Then make it taste a little better. There’s a scromlet. If you are ever, ever in the area of Hughesville, PA, Kathy’s Cafe is a do not miss. p.s. When I went with my mother the next day, she told the waitress that I was writing a blog post on Kathy’s. The waitress didn’t know what a blog was. Did I mention how much I love this place? When you mentioned the original scromlet, a not-so-small part of me died and went to that wonderful place…I MUST try it! I must try this place next time I’m in H-ville! This was the best post yet. I could taste that scromlet! I think my love for words hemorrhaged inside me. Thanks for this info! CORRECTION. Your Dad DESPISED the wheatgrass shot. The taste was as cloying as se other regrettable taste sensations I have had one taste of and them decided once was more than enough, e.g. Lima beans, halavah, martini. As with these a shot of wheatgrass should be followed by a shot of Listerine!